Tout Wars Head To Head Champion 2017: Vlad Sedler | TOUT WARS! At the end of April, Vlad Sedler, Andrea LaMont and Howard Bender were tied for second place, behind Peter Kreutzer’s hot start. 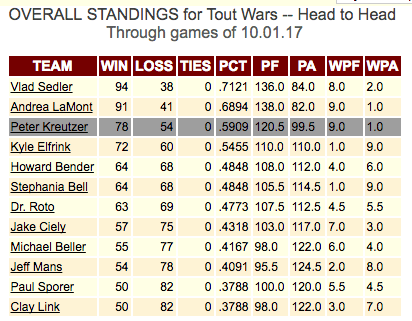 But Kreutzer stumbled the next week, and so did Sedler and Bender, leaving LaMont alone in first. By the end of May, Sedler had climbed back up to second place, four games behind LaMont, and in the last period in June he moved ahead by three games. While his lead seesawed from series to series, Sedler didn’t reliquish the lead the rest of the way, and finished with a three-game lead over LaMont in the end. Sedler’s team was built around the power of Paul Goldschmidt and Giancarlo Stanton. He bought Noah Syndergaard as his ace, but when Syndergaard went down he relied on break seasons for Robbie Ray and James Paxton, and the reemergence of Dallas Keuchel as an ace to carry his staff. Plus Craig Kimbrel as a closer. Next Next post: Tout Wars 2017: What Happened?